I get food envy. I see home bakers post photo's of homemade sourdough bread and sourdough starters overflowing and my question to these lovely people is... 'how have you found that extra few hours in the day that I am somehow missing? Whats the secret?!?' I can hardly keep my pot plants alive let alone attempt sourdough these days. If you're like me and also get these envious feelings because of homemade bread then I have a recipe for you, it's going to fulfil your sourdough eating and making cravings but doesn't have the responsibility. It's perfect for all those fellow sourdough dreamers out there. You get the same crusty, chewy homemade bread but it's all in a nights work. No feeding a starter or keeping anything alive. It's the no commitment needed, faux sourdough loaf... the single girls sourdough AND it's midweek friendly. You read that right. Freshly baked bread on a Wednesday. Yep. This genius recipe that does all the work while you sleep is in Gennaro Contaldo brilliant new cookbook Gennaro's Italian Bakery. The Pane Cafone, Neapolitan Peasant Bread. It's a traditional Italian recipe for a no-knead bread from Naples originally baked in a wood-oven. 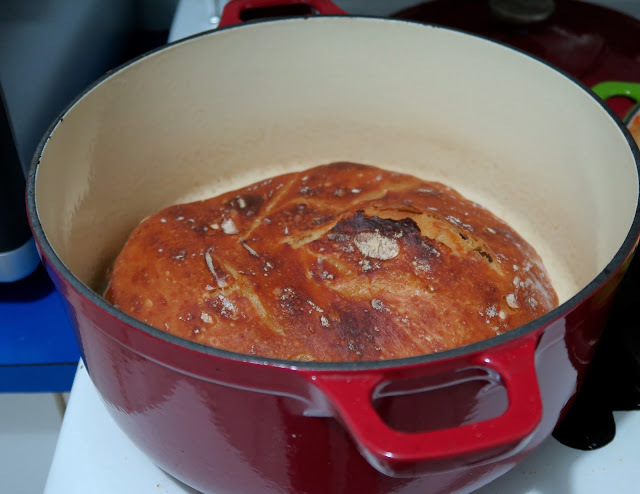 It has a 24 hour slow rise then a little folding and resting, then its just baking your little loaf in an extremely hot oven in an extremely hot cast-iron pot. It's changed my bread making days forever. This little loaf was so delicious and simple. 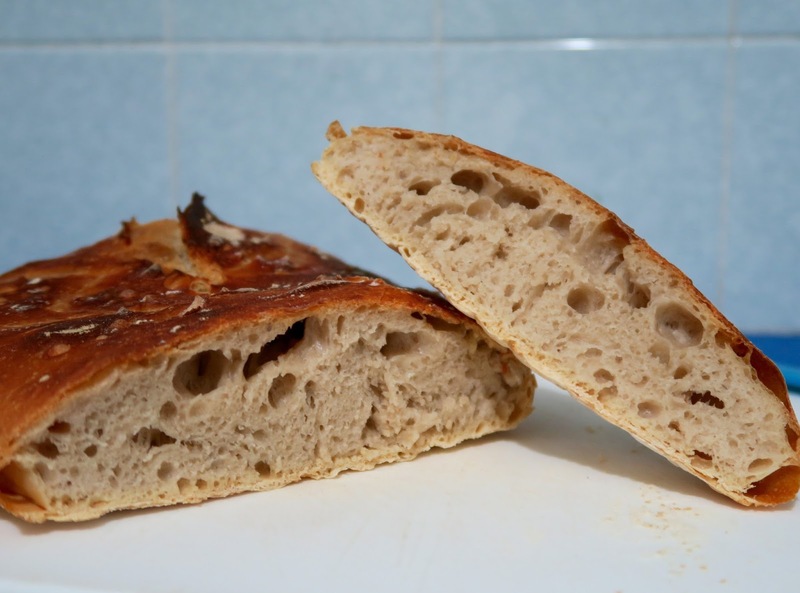 The crust was satisfyingly crunchy and chewy with the inside having more flavour then other homemade breads as the slow rise gives it that almost sourdough taste. It was a seriously good loaf of bread and even kept well the next day, just needed a little reheat in a warm oven and it was just as good as straight out of the oven smothered in salty butter. The recipe calls for fresh yeast but unless you know someone in the industry or want to buy a large amount of it, the dried stuff you get in the supermarkets works fine. I used roughly half the amount in dried yeast which worked out to be just under a 1/2 teaspoon - I've made a note in the recipe below. Also make sure you have the sharpest knife you own ready at hand to score the top once you place the dough in the hot pot. I fumbled and didn't have a sharp knife ready so didn't get a nice pattern or lift on top of my bread but thats just being picky now and I'm so stoked with the recipe, sharp knife or not. It's going to taste delicious. There are so many more recipes in Gennaro's new cookbook that I cannot wait to get stuck into like the olive oil soaked focaccia, traditional Italian pizza dough, Calzone, Sicilian Brioche filled with gelato and beautiful fruit and jam tarts. If these other recipes are anything like the Pan Cafone, they are going to change the way you work with dough. Everything looks so beautiful in this cookbook, a little rustic but it has home and tradition all over it. My advice to you my lovely readers is; go now and get your self some dried yeast (or fresh if you're lucky) and start the recipe below because in 24 hours you could have a little loaf just like mine. No food envy, just 24 hours of dreaming of the best home made bread you'll make. I know I'm off to put together another batch of Pan Cafone so I can have a freshly baked 'faux sourdough' little loaf tomorrow night. - Dissolve the yeast into the lukewarm water and set aside. Place 300g of flour in a large bowl, add the yeast mixture and mix in gently with a spoon (this will look like a shaggy mess, thats ok). 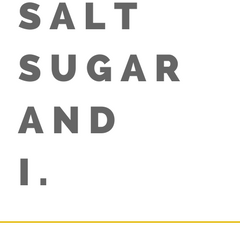 Combine the remaining flour with the salt in a bowl, then add this to the flour and yeast mixture, gently mixing until all ingredients are amalgamated (you may need a little more water, so add it carefully). Cover with clingfilm and leave to rest in a warm place for 24 hours. Small bubbles will appear and this is normal. - After 24 hours, place the dough on a lightly floured work surface and gently fold over a couple of times to form a ball. Cover with a clean tea-towel and leave to rest for a further 2 hours. - After 1 hour, preheat the oven to 220C/450F and place an empty cast-iron pot (without the lid) in the oven. - Remove the pot from the oven and carefully place the bread inside. 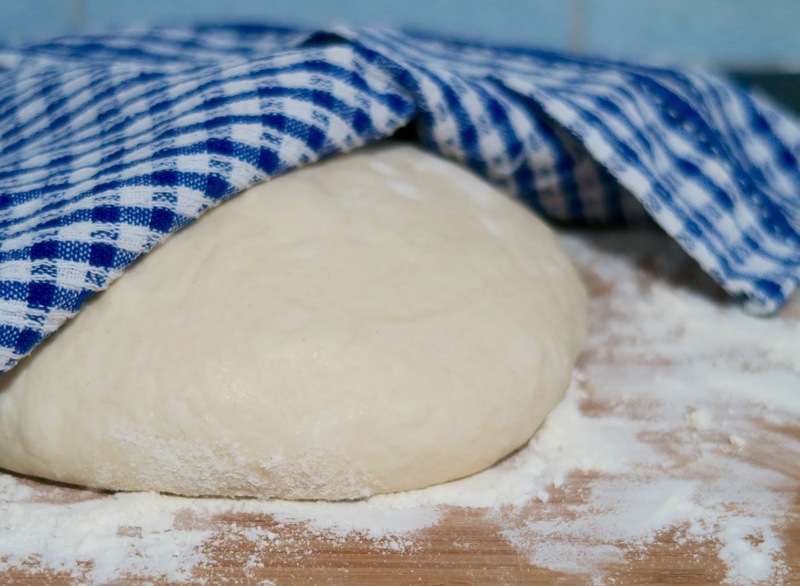 Make a couple of incisions on the top of the dough using a very sharp knife, cove with the lid and place immediately back into the hot oven on the bottom shelf. - Bake for 30 minutes. Remove the lid and bake for a further 15 minutes. - Remove from the oven, leave in the pot for 10 minutes, then turn out of the pot onto a wire rack and leave to cool completely - if you can wait that long! Slice and enjoy. For the past two weeks I've been cooking for one, or should I say cooking for six and eating the same thing all week while still filling my freezer. I've also eaten a lot of random rice bowls. Not the lovely vibrants looking ones which are all over instagram where these amazingly organised people keep dressings and sauces and roasted vegetables just lying around ready to make a rice bowl on demand. The kind of rice bowls I've been eating start with those 90 second rice packets, a hard boiled egg, a can of tuna and a random mix of anything else leftover from the previous nights dinner or a can of beans on top. And let me tell you they are not instagram worthy at all... I sit watching trashy tv after night school and am so hungry that I could eat anything which is why I can stomach my random rice bowls which lack flavour and texture but do a great job at filling a hole. So when the lovely cookbook The Dinner Ladies by Katherine Westwood and Sophie Gilliatt arrived in the mail I was only too happy to start cooking from it. 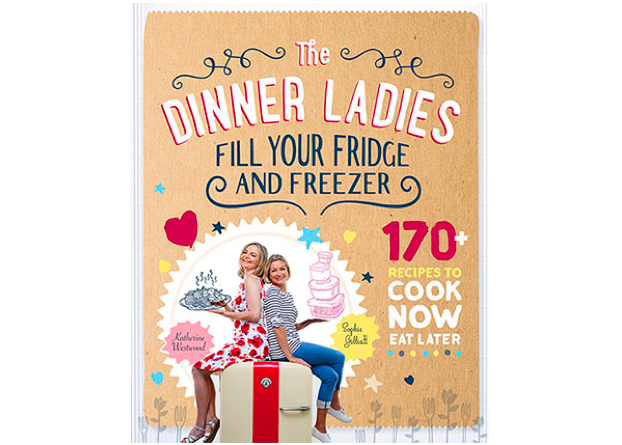 I mean it promised to fill my freezer and it is all about doing the prep work in advance and enjoying midweek dinners rather then being the headless chook most of us are when trying to complete these trendy 15 minute meals. The only catch is you need to be organised and prepared. Something I am somewhat good at and others times I envy everyone who manages to look like they have their stuff together. 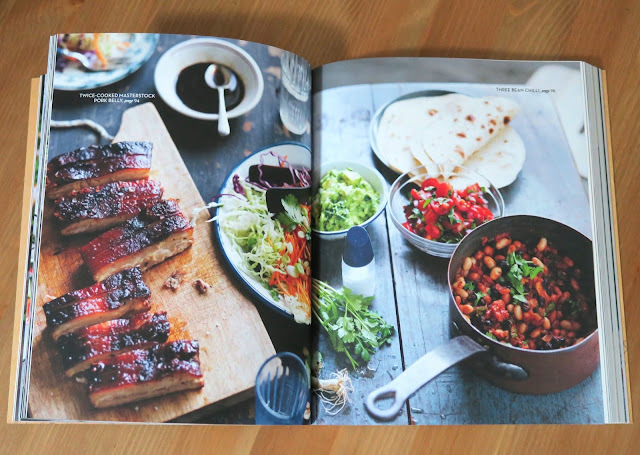 Flicking through this book the are pages full of feasts just waiting for a family to dig in like twice cooked master-stock pork belly, three-bean chilli, lasagne, sausage rolls and also lighter dishes for the warmer nights like sesame prawn stir fry. 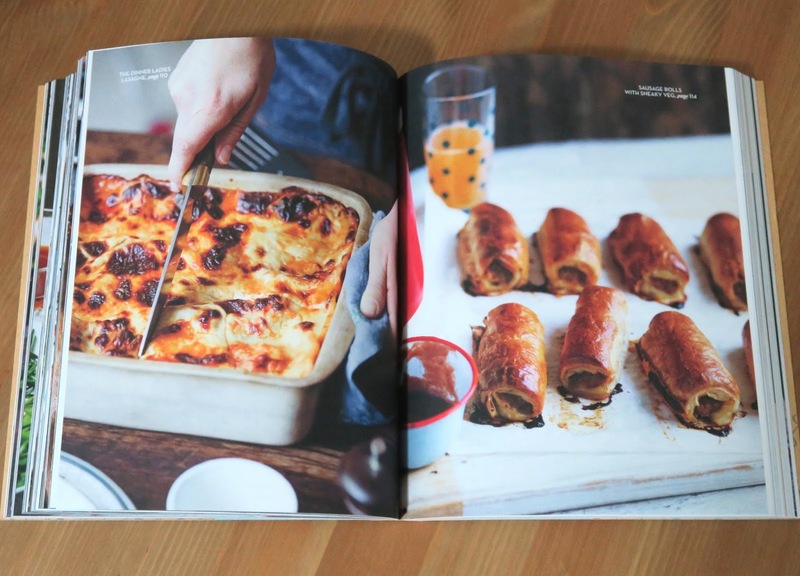 The book comes with all the tricks to make feasts happen without the stress. It shows you it possible to eat a delicious, substantial dinner (that isn't a dodgy rice bowl) midweek. A couple of these cook ups in the freezer and my weeknight dinner disaster is sorted. The recipe I chose to make first from this book was the eggplant parmigiana. I'm not the biggest meat eater when I cook for one and I LOVE eggplant and tomatoes and mozzarella so this was a perfect option. The fragrant bunch of basil in the local greengrocer also caught my eye or should I say nose as the smell was incredible. Summer is coming!! It's starts with thickly slicing the eggplants and roasting them in a hot oven with salt and olive oil while you cook your basic tomato sauce. Once they are both done it is time to start assembling. 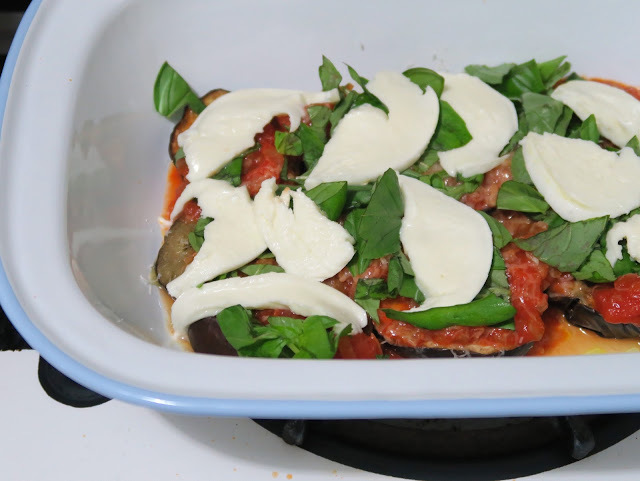 If you are making it ahead, wait until everything is cooled before assembling but if you are going to cook it straight away start assembling the roasted eggplant and the tomato sauce with generous amounts of fresh basil, fresh mozzarella and grated parmesan cheese making sure you end with a cheese layer on top. Bake it in the oven until cooked though and bubbling at the sides. The recipe suggests to serve it with a green salad but I couldn't help but add some buttered pasta to mine too... I'm a carb lover what can I say. 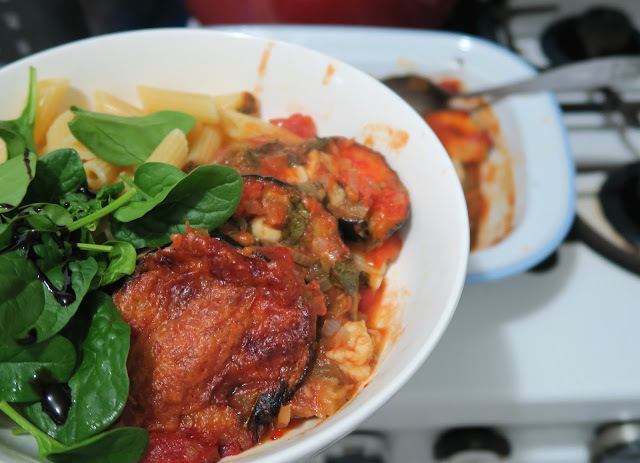 The eggplant parmigiana from The Dinner Ladies will definitely start becoming a regular midweek dinner for me. Especially if I can make it over the weekend then just bung it in the oven midweek and dinner is done. So easy, so delicious and I think it's going to make the BEST filled baguettes for lunch the next day too. YUM. Make ahead: The whole dish can be assembled up to 3 days ahead and stored, covered, in the fridge. Bake it on the day you mean to serve it and serve warm or allow to cool to room temperature before serving. - Line two baking trays with baking paper. Cut the eggplants into slices about 1.5cm thick, sprinkle with salt, lay them on the baking trays and brush with 1 tablespoon of olive oil. Bake for about 20 minutes or until golden brown and soft. Remove from the oven and set aside to cool. If not making ahead, leave the oven on. - Meanwhile, in a saucepan, heat the remaining olive oil over medium-low heat and cook the onion and garlic with a pinch of salt for about 10-15 minutes until soft and sweet, stirring occasionally. When completely soft, add the tinned tomatoes, thyme and a splash of water and continue to cook gently, partially covered, for about 20 minutes. Add the vinegar and taste for seasoning - you may need to add a pinch of salt and/or sugar if the tomatoes are particularly sharp. Set aside to cook. - Now to start the assembly. 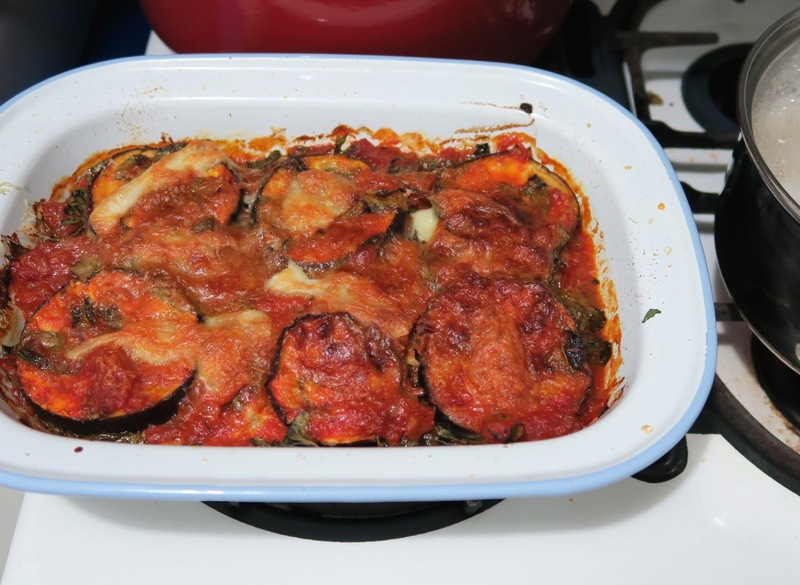 In an oven proof dish, place a layer of eggplant on the bottom. Top with one-third of the tomato sauce, then half of the basil, a third of the mozzarella and a sprinkling of parmesan. Repeat until you have three layers of eggplant, finishing with mozzarella and an extra snowing of parmesan on top. - Place in the centre of your oven for 25-30 minutes or until cheese is melted and bubbling at the sides. Serve warm or at room temperature with a mixed leaf salad and/or some buttered pasta and/or a crusty baguette.